On Tuesday, February 28, 2012, Congress unveiled a marker to commemorate the important role played by laborers, including enslaved African Americans, in building the United States Capitol. Their contributions were essential for the constructing what would later become known as the Temple of Liberty. When construction of the U.S. Capitol Building began in 1793, Washington, D.C., was little more than a rural landscape with dirt roads and few accommodations beyond a small number of boarding houses. Skilled labor was hard to find or attract to the fledgling city. Enslaved laborers, who were rented from their owners, were involved in almost every stage of construction. The federal government relied heavily on enslaved labor to ensure the new capital city would be ready to receive Congress when it moved to Washington from Philadelphia in 1800. To commemorate the role that slave labor played in the construction of the Capitol Building, House Concurrent Resolution 135 was passed by Congress directing the Architect of the Capitol to design, procure and install a slave labor marker in a prominent location in Emancipation Hall. The design and location incorporated the recommendations developed by the Congressional Slave Labor Task Force Working Group. THIS SANDSTONE WAS ORIGINALLY PART OF THE UNITED STATES CAPITOL’S EAST FRONT, CONSTRUCTED IN 18-24-1826. IT WAS QUARRIED BY LABORERS, INCLUDING ENSLAVED AFRICAN AMERICANS, AND COMMEMORATES THEIR IMPORTANT ROLE IN BUILDING THE CAPITOL. Although the entire contribution of enslaved African Americans in the construction of the Capitol Building cannot be determined due the scarcity of documentation, there is enough information to know that the role they played had a significant impact on the project. The site of the new capital city was located in an area that had few carpenters, bricklayers, stone cutters and other tradesmen necessary to construct such a project. Engineers and architects were brought in from other areas, but the majority of the work fell upon the laborers in the area, who were comprised mostly of African American slaves. These slaves, as well as other the laborers, quarried the stone used for the floors, walls and columns of the Capitol, sawed both wood and stone, and became skilled in brick making and laying. Carpentry was also one of the more significant contributions slaves made to the construction of the Capitol as they framed the roof and installed its shingle covering. One of the most significant contributions by an African American slave was made by Philip Reid, who deciphered the puzzle of how to separate the five-piece plaster model of the Statue of Freedom. Today, he and countless others are recognized for the role they played in building this monumental and historic symbol of democracy. 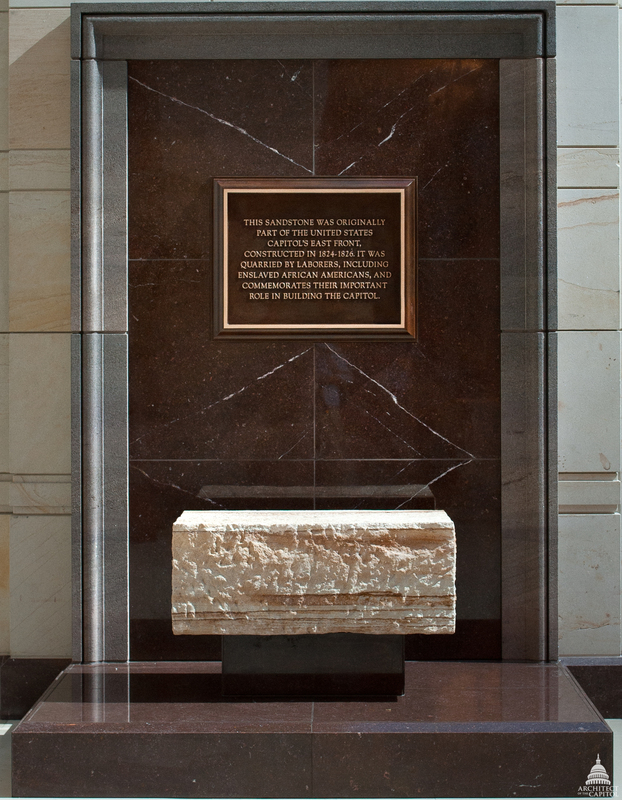 The marker is located towards the western end of the northern wall of Emancipation Hall in the Capitol Visitor Center (CVC) where it is bathed in sunlight for a portion of each day and will not interfere with visitor flow. The intensity of the daylight will enhance the visibility of tool marks on the presentation stone. The marker is open to all visitors to the CVC, where visitors can learn more about the Capitol Building and its history.